Here is what I’ve learned in the world of home ownership: There is always money to be spent. And I’m not just talking mortgage, taxes, insurance, and the like. The thing is, you want to fill your house. This makes it a home. But in light of those other expenses I mentioned, the conversion from house to home can be tricky when you’re on a budget. In the beginning, I learned these lessons the hard way. I made knee-jerk decisions about furniture, decor, and necessities, filling our rooms with stuff that I eventually wound up hating and having to replace. That’s twice the cost! So now I’m much more contemplative before I buy. I want something that suits our style, suits our needs, and suits our life (ie, can it hold up with two crazy kids and one large dog?). For, literally, the past two years, we’ve been slowly but surely redoing our living room. We’ve made it through hundreds of carefully thought out steps and purchases, and now I’m finally to the finishing touches. This includes throw pillows, and if you want to talk about something that seems like an outrageous waste of money to me, it’s throw pillows. I’m ashamed to say, old habits die hard, and in an effort to just get something on the couch, I purchased some semi-coordinating fabric and made some fine pillows. They were fine. But, okay, I hated them. So it was time to research some options. And that’s when I stumbled upon Nate Berkus’s line for Target and found these. They were cute; but $25 only got me a scrawny square that would serve no purpose on our furniture, and the colors weren’t quite what I needed. 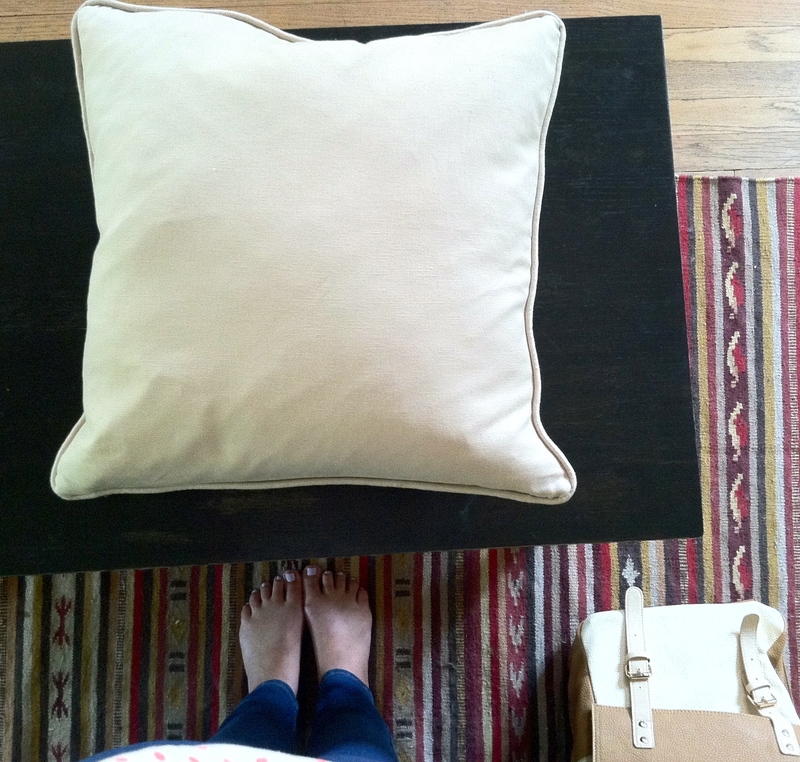 Then one aisle over, I found huge, cushy tan pillows–on sale for $15 each! The color perfectly coordinated my new rug and it was a great neutral tone for my bright furniture. I started scheming a bit. Could I knock-off Nate Berkus and get a fabulously larger version of the pillows I craved at a cheaper price? The answer: Yes! 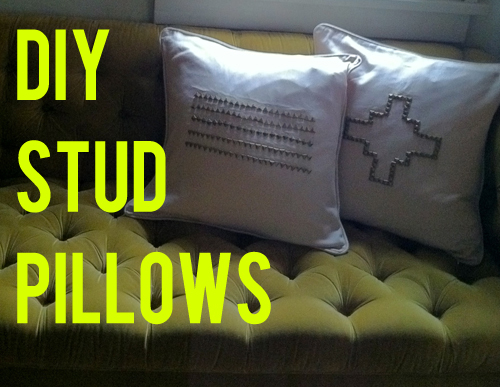 It took a little work and a bit of trial and error; but I now have custom stud pillows, the perfect adornment to my couch corners. 1. Start with a neutral pillow that has a removable cover (or your not-yet-stuffed fabric if you’re making your own). 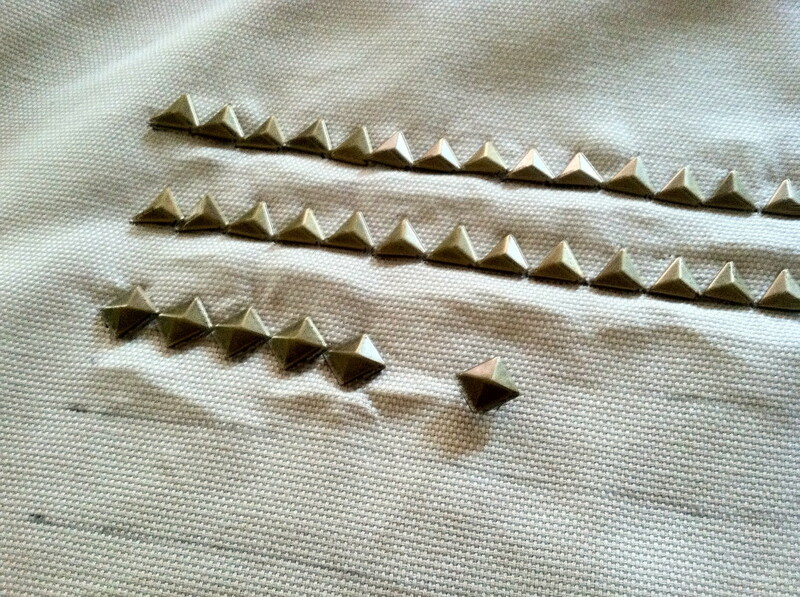 The material on my pillow was a non-stretchy canvas-type material, and this worked great with the studs. 3. 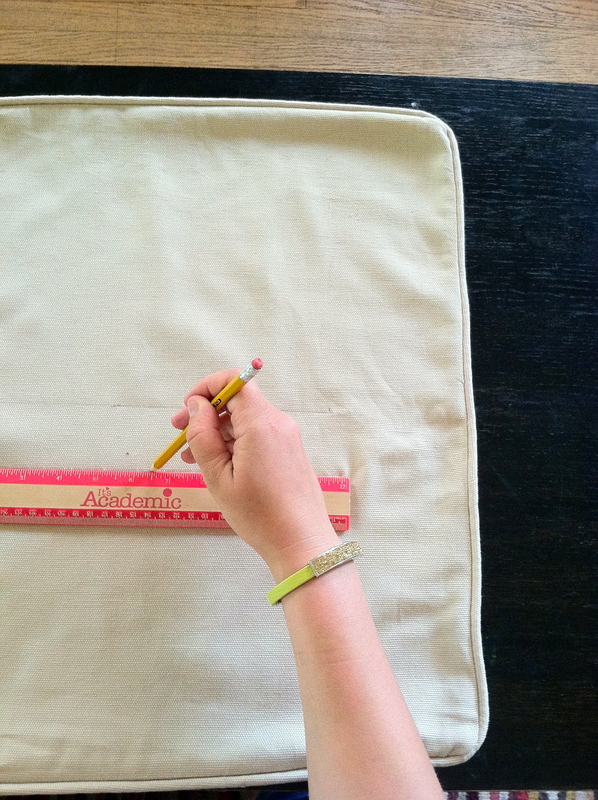 Trace your shape on to the pillow. 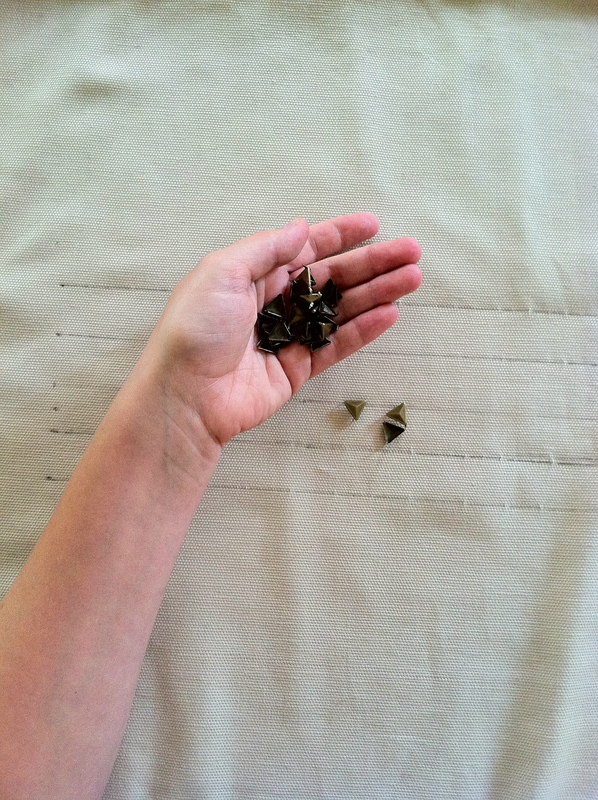 I just used a regular pencil to do this, and the excess pencil wiped right off with some fabric cleaner. 4. 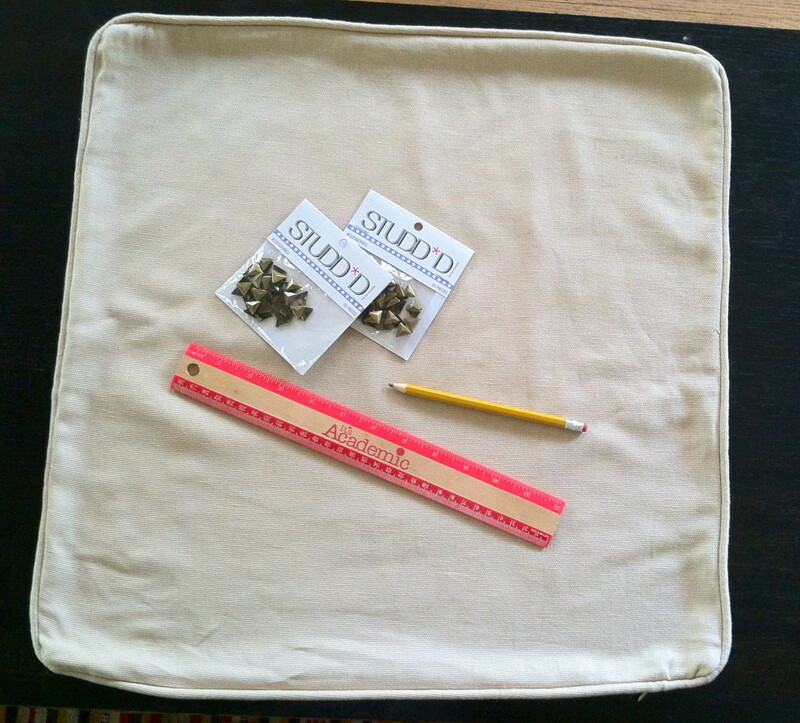 Lay out the studs to make sure that they will fit evenly across your design. Adjust where necessary. 6. Be warned: This is a labor of love. 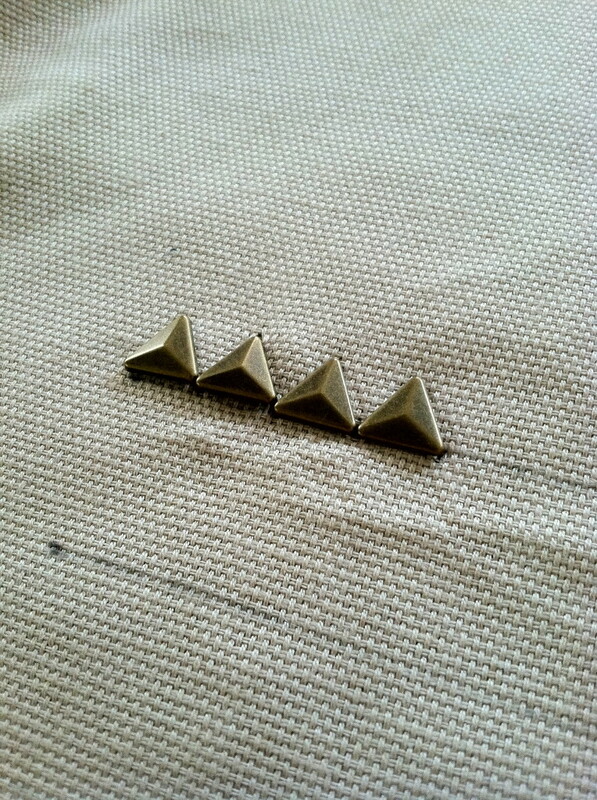 The process itself is a bit tedious, and I also had trouble getting the triangle studs to stay closed. I had to be very precise, redo several, and in the end, decide it was okay if my designs were a bit… free-spirited. 7. 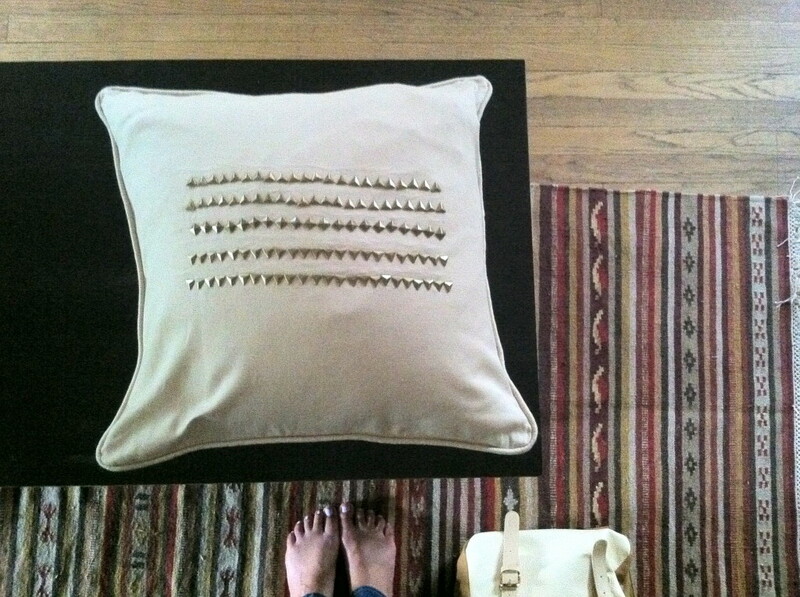 When you’ve finished securing your studs, carefully put the pillow back into the cover, zip (or sew) closed, and voila! Designer pillows custom-made for you! What is your favorite home decorating DIY project?